As of the writing of this post, I'm confronted with a conundrum. According to the Yves American website, the product I'm about to review doesn't exist. The Canadian version of their page, however, does say that this product is available in Canada. So here's the Canadian page link to Yves Veggie Corn Dogs. I'll try to keep an eye on the US page and update to that link when it shows up. In any case, let's see how they taste, shall we? 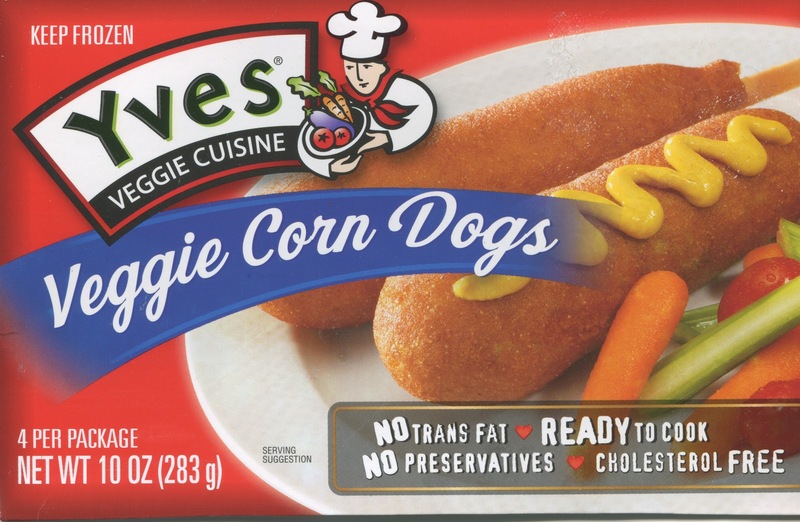 I've had some pretty bad experiences with Yve's stuff before, so I was a little wary of these corn dogs that suddenly showed up at my local Target. But hey, it's for science! The box contains four corn dogs, so I threw a couple of them into the oven for the 22 minutes it calls for. Usually with frozen corn dogs I need to bake them extra time to get the crispy outside I like, but this time was perfect. It came out looking exactly right, and smelling right as well. I started to get a little excited about tasting these. Enough teasing - I stuck that thing right into my mouth. The cornbread part was amazing! Nice and fluffy and corn-bread-y tasting. The big surprise here was the hot dog. It actually tasted like a (cheap, misc-meat) hot dog. Nothing really weird about it like the last two Yve's things I tried - it was just a truly tasty corn dog. I don't have much to say about these except that I'm really excited to eat the other two I still have in the freezer. Buy these if you see them - they are great! It's been a while since I tested out a homemade fake meat recipe, and a recent post about this blog on Reddit produced this very promising-looking recipe. 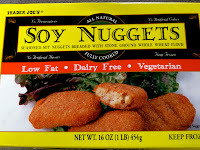 For those of you who don't feel like following the link, I'm testing out vegan beanballs. A Reddit reader pointed out that these work better if you let them rest a bit after mixing and before shaping, so I mixed it all up in the late afternoon and then stuck it in the fridge until dinner time. I figured chilling it would also help things hold together better. 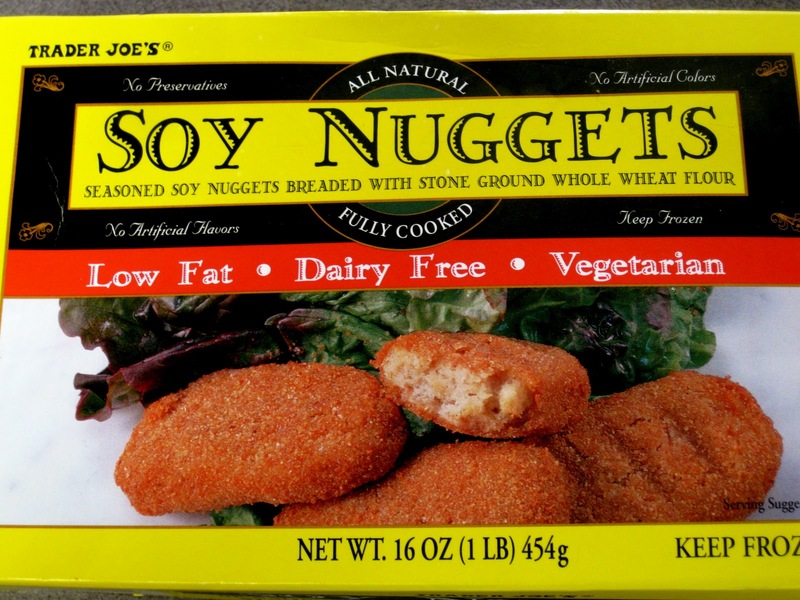 The same reader also informed us that these beanballs do not taste like meat, but instead "taste like awesome". With all this in mind, I started getting ready to cook some spaghetti to go with these beanballs. While the water was coming to a boil, I shaped the beanballs and heated some oil in a pan. When the oil was hot, I popped the beanballs in the pan and started the browning process. After browning them on all sides to get a nice crusty exterior, I took one out of the pan so I could check it before dumping a bunch of sauce on them. The first thing I noticed was that it was very mushy on the inside. Like, refried-beans-mushy. They weren't that mushy before I cooked them, which was rather unexpected. They did hold together reasonably well despite the super mushy interior. Perhaps that's how it was supposed to be? The person who wrote the article with the recipe that I linked to earlier also found them to be mushy, but had used a different quantity of beans. Aside from the texture, the flavor was pretty good. Imagine mushy beans flavored with steak sauce, and that's about what we had here. The steak sauce flavor was really strong. I think if I make these again, I'd try making them with tomato paste instead, because it was a little weird, but not bad. I also wonder if baking them rather than frying them would result in a firmer texture, but I don't really know why that would be the case.